A report issued by the Missouri Department of Natural Resources indicates that the number of hazardous waste sites with confirmed groundwater contamination is 607. The report lists the number of hazardous waste sites in Missouri as 4,905, of which 710 have completed cleanup. Another 1,205 have active remediation. Known groundwater contamination does not mean that people have been exposed, but groundwater contaminants have the potential to spread underground, creating the risk of widespread contamination. In Missouri, about 32% of publicly supplied drinking water, and almost 100% of self-supplied drinking water, is obtained from groundwater. All totaled, about 42% of Missourians depend on groundwater for their drinking water. Thus, it is essential that Missouri’s groundwater be free of contamination. The Water Protection Program of the Missouri Department of Natural Resources monitors the quality of Missouri’s ground water. In Missouri, groundwater contamination has come from several sources: the application of fertilizers and pesticides, the disposal of contaminants by spreading over the ground, the storage of contaminants in underground storage tanks, septic systems, hazardous waste sites, industrial facilities, mines, salt water intrusion, and spills. All of these except salt water intrusion represent a potential hazard to human health. The Missouri Water Quality Report (Section 305(b) Report), 2012 reports on groundwater monitoring and contamination at hazardous waste sites. This report is somewhat different from other documents I have reported on previously. (Abandoned Mine Lands, Superfund Sites, Toxic Waste Sites) Previously reported documents all focus on one specific list of sites, but cover multiple kinds of risks. This report focuses only on groundwater contamination, but it covers nine different hazardous waste site lists. The table at right is an adaptation of data from Table 11 in the report. I suspect that there is some duplication of sites between lists, but I don’t know how much. Thus, although I have included totals in the table because some sort of summary statistic seems needed, some sites may be double counted. Similarly, while 710 sites are listed as having completed cleanup, there is clearly overlap in the four columns summarizing different levels of remediation. From this information alone the precise number of sites with currently active contamination or that have been reliably contained cannot be known. 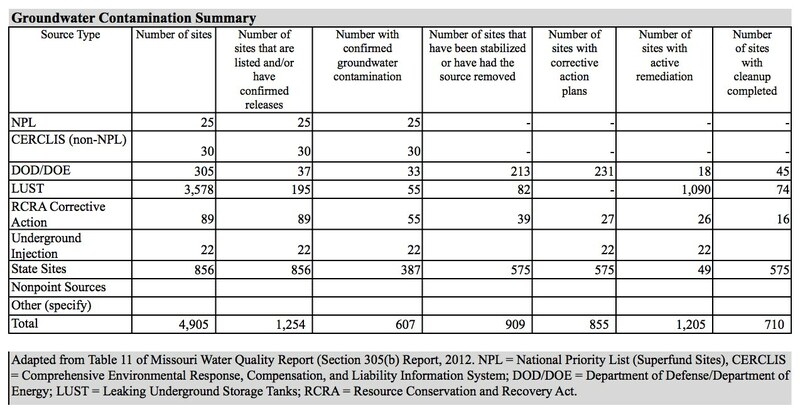 The table shows that leaking underground storage tanks are by far the most numerous sites, but that state sites represent the largest number of sites with confirmed groundwater contamination. They also represent the largest number of sites where cleanup has been completed. My next post will concern groundwater contamination from pesticides and herbicides, and the post after that will focus on the status of Missouri’s drinking water. Missouri Water Quality Report (Section 305(b) Report), 2012, Water Quality Program, Missouri Department of Natural Resources, http://www.dnr.mo.gov/env/wpp/waterquality/305b/index.html. By mogreenstats in Water on 2013/03/18 .